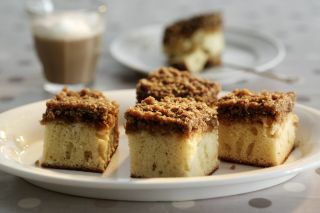 Originally called Drommekage fra Brovst (comes from the Brovst region of Denmark), this Danish Dream Cake is truly divine...a one-of-a-kind comfort food. Remember to read this recipe thoroughly as the topping is spread over the baked cake, then placed back in a 225 degree C/425 degree F oven to bake for another 5-10 minutes. In a mixing bowl, combine all topping ingredients. Set aside until ready to spread over cake. Preheat oven to 200 degrees C/400 degrees F. Grease an 8 or 9-inch (20-22cm) square or round baking pan. If desired, line baking pan with parchment paper, then grease paper. Sift the flour with the baking powder. Melt the 50g butter and mix with the 200ml milk. Beat the eggs with the sugar and vanilla extract until light and fluffy, then fold in the flour mixture. Lastly, fold in the butter and milk mixture. Pour into prepared baking pan and bake in preheated oven for about 20 minutes or until wooden pick inserted into center of cake comes out clean (leave oven on and set to 225 degrees C/425 degrees F). Remove cake from oven and immediately spread the topping over cake and bake cake for an additional 5-10 minutes at 225 degrees C/425 degrees F. Cool cake completely on wire cooling rack before serving. Cut cake into squares (or wedges, if baking cake in a round pan). The family loved the cake. Any chance of making the topping less sweet? Danish student teachers at my school for 6 months practice make this each time we bid farewell to them - It is DELICIOUS, and goes very fast! Ours are served, decorated with miniature Danish flags. Add a cup of coffee to the filling. It makes it less sweet and adds a wonderful flavour. This is GREAT! I am actually Danish and all I can say is that it represents the Danish version 100%! It's a GREAT cake. The only thing I'd say is that I'd put a bit more filling on top, and bake that for a little bit longer (just because it's the best part of the whole cake). I am actually from Denmark, grew up there and there is no place like Denmark because it's a lovely country, and that is just proven by this cake. It's the best cake in the world. My Mum used to make it for us when I was growing up In Denmark. I love you Mum. Your're the best Mum in the world. Oh my god!! This cake is so nice !! I made it for the family and am only 12! My mum luvs it. I had lost this recipe long ago and I am glad to find it, thank you very much! By the way, I miss little Danmark and their healthy foods. Danmark is the best country I have ever seen! I had a friend who moved to England from Denmark and said they eat this with a coffee for a sweet breakfast. She made this a few times for me just hoping the recipe was the same as hers as we lost touch. Do not make this in an 8 or 9 inch round pan.. it won't fit. It's a great cake to have with tea or coffee. Much like everyone else, I grew up on this cake and knew how to make it by heart. After moving to England and getting too busy for home cooking, I forgot the exact measurements as ingredients were easy enough to remember. The cake never came out quite as my step mothers aunt used to make it, but after reading several recipes, memory has been restored. I would also add that topping gently melted in a pot before spreading over the cake is necessary to get the perfect result! thanks for posting! If you bake this according to the recipe, it takes much longer to bake. I used a 9 inch square and it took 30 minutes, and it rose pretty high. You can also microwave or cook the topping on the stove a bit first and I think it comes out better. Oh my word, can't believe I have found this recipe again, my friend who was Danish gave it to me several years ago and it is the best cake can't wait to make it again ?